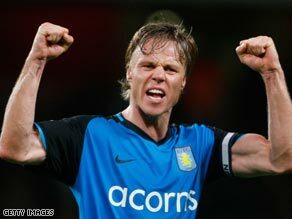 (CNN) -- Aston Villa captain Martin Laursen has announced his retirement because of persistent injuries. Laursen had been at rock at the heart of the Villa defense in recent years. The 31-year-old Danish defender has endured an injury-plagued career and has been out of action since suffering a knee injury while playing for Villa in January. Laursen was faced with a lengthy rehabilitation period on his right knee before he would return to full fitness and has opted to retire rather than undergo another major operation. Laursen joined Villa in the summer of 2004 but his formative years at the club were plagued by a troublesome left knee injury which also restricted him during his earlier spell at AC Milan. The Dane had seemingly shaken off those concerns in recent years as he established himself at the heart of the Villa defense, with manager Martin O'Neill rewarding his good form with the Villa captaincy at the start of this season. But after injuring his right knee in January, Laursen retired from international football with Denmark before his decision to call an end to his football career completely. "Villa are sad to announce Martin Laursen's retirement from football," a statement on the club's official Web site read. "The club captain made the decision after being faced with another lengthy spell on the sidelines. He elected to hang up his boots rather than undergo another major operation -- this time on his right knee. The retirement of the lion-hearted defender will be a huge loss to the players, manager and fans."